If you have a medical emergency please stop now and contact local emergency services. If you are in Australia dial 000. If you are overseas and don't know who to call, we recommend you contact the Australian Government's 24-hour Consular Emergency Centre on +61 2 6261 3305. In these Terms, 'us', 'we' and 'our' means joebloe Pty Ltd (ACN 613 620 170). joebloe is an online service that sells hair loss products to men. We offer several ways to purchase this, you can either purchase each product on their own or purchase a subscription which we will mail you out products every 3 months. Our website content and any communication you have with joebloe representatives should not be considered medical advice or taken to mean that any particular medication or treatment is safe, appropriate, or effective for you. We heavily suggest you contact your doctor prior to taking our products. You must be a registered member to make orders on our website. You consent for us to contact you by email or phone if and when the need arises using the email address and phone number you provide when creating your joebloe subscription account. You agree that all information that you provide to our staff will be true and complete to the best of your knowledge and that you will not purposefully omit to provide any information that could reasonably be judged to be potentially relevant to our staff in providing the service. It is also your responsibility to inform your existing doctor of any medicines joebloe sells to you. You should not register or complete questionnaires on behalf of anyone other than yourself. You agree that you will not create more than one joebloe online accounts. When you register your account, you will also be required to create a password. You are responsible for keeping this password secure and are responsible for all use and activity carried out under your account. If you suspect or become aware of, any unauthorised use or misuse of your account or any other breach of security in relation to your account, you must notify us immediately and take immediate steps to re-secure your account (including by changing your password). To the extent permitted by law, joebloe makes no warranties, whether expressed or implied, as to the content of any medical consultation conducted through our service. You and your doctor are solely responsible for all information and/or communication sent during a consultation or other communication. joebloe does not guarantee that an online consultation is the appropriate course of treatment for your particular healthcare problem. You agree to contact your own doctor immediately should your condition change or your symptoms worsen. If you require urgent care, you should contact your local emergency services immediately. To the extent permitted by law, the services are offered on an "as is" basis and used by the patient solely at his or her own risk. joebloe may, among other things and without notice, withdraw, suspend or discontinue any functionality or feature of its services. You agree that any medicine joebloe sells to you (the customer) will be solely for your own personal use and that you will not allow any other person to take the medicine. You agree that before taking any medicine that you have purchased from joebloe.com.au you will read all the information that we will provide you with either online or in printed form, you will read the medical information leaflet (if any) that accompanies the medicine or is sent to you by email and you will follow any advice that we provide you with. If the advice that we provide you with contradicts the advice of your GP, we suggest you contact your GP immediately and discuss our products with him to see if they are right for you. You agree that if you consume our products and you suffer from any noticeable side-effects, you will contact us to allow our staff to fulfil our duty of after-care and provide advice on how best to deal with the side effect. Please do this and don't be a hero. We store data online and we use Secure Sockets Layer (that's SSL for those playing at home) to provide users secure and private access. As part of the Ter,ms you agree to your information being stored in this location and accessed in this way. we have a legal obligation to protect all patient confidential data. joebloe is not allowed to share your confidential data with third parties, including other doctors, who are unconnected to our joebloe service without your explicit consent. We are not liable to you or anyone else if interference with or damage to your computer systems occurs in connection with the use of this website or a linked website. You must take your own precautions to ensure that whatever you select for your use from our website is free of viruses or anything else (such as worms) that may interfere with or damage the operations of your computer systems. We may, from time to time and upon notice to you, change or add to the website (including the Terms) or the information, products or services described in it. However, we do not undertake to keep the website updated. To the extent permitted by law, we are not liable to you or anyone else if errors occur in the information on the website or if that information is not up-to-date. For certain promotions, additional terms and conditions may apply. If you want to participate in such a promotion, you need to agree to the relevant terms and conditions applicable to that promotion. In case of any inconsistency between such terms and conditions and these Terms, those terms and conditions will prevail. Without limitation to the foregoing, joebloe at its total discretion may occasionally provide discount voucher codes to customers. If these voucher codes are provided personally to a customer, they may not be passed on to or used by any other customers. If these voucher codes are provided to the general public with our express authority, they may be used by anyone. These voucher codes can only be used towards the payment of products purchased from our website. Every voucher code can only be used once per customer and may not be used in conjunction with any other discounts we offer. Unless otherwise stated all voucher codes expire 1 month after publication. We will determine the content of terms governing voucher codes in its absolute discretion and may amend these terms at any time. Our first month for free is offered to only our 3 month subscription. A maxium discount of $100 will be taken off your first order, in which the normal amount will revert back to the orginal pricing on your next order which will occur 3 months after your purchase date. To edit / cancel your subscription you will need to login to your dashboard in order to action this request. Please note that we will need up to 5 working days to process this edit/cancellation. If your order is processed and shipped we are unable to refund your order as the shipment has already left the warehouse. a product or pricing error is identified. We do not take refunds on any of our products once they have been dispatched. Due to state health regulations, general medicines including any preparation that is taken orally cannot be returned or refunded. This is because once the product has left our warehouse, the storage conditions of the product cannot be guaranteed and also it is possible the product could be tampered with. Refunds, if applicable, will only be made using the online payment gateway to the card originally used for payment, minus any discount and taxes). You expressly authorise joebloe pty ltd to process the payment of the subscription price via your relevant payment method at the time a checkout is completed. We may, upon written notice to you, change the price for your current subscription, to take effect the next time you renew your subscription. We will deliver the medicine via various shipping partners via Sendle. Your hair loss products will be dispatched within one to three business days via the Sendle network. We always do our best to dispatch products on time, but ultimately rely on our shipping partner to bring the parcel to your door. joebloe cannot be liable for any loss or damage (including but not limited to consequential loss) resulting from a failure to deliver in accordance with these timetables. All parcels will be delivered to the provided address and will require a signature on receipt. It is recommended to provide a work address for delivery if no one is home during business hours. Due to security issues, the parcel cannot be left unattended. Where no one is home to sign for the parcel, a card will be left detailing the nearest postage outlet where the parcel can be collected during normal business hours. We believe strongly in evidence-based medicine and have developed our products based on over 25 years of clinical data and research. We are very confident that our joebloe products can make a real difference. If you are not happy with our products within the first 3 months of use, you may request a refund on the products ordered in accordance with the below terms. 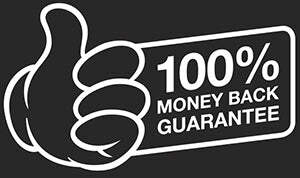 you can only make claims under the joebloe money back guarantee once throughout your lifetime. return the empty product packages AND a receipt/proof of purchase to Joeboe Pty Ltd - Bakery Lane, Level 2, Suite 6, 690 Ann Street, Fortitude Valley, 4006 Queensland. Your use of this website and use of and access to any Content does not grant or transfer any rights, title or interest to you in relation to this website or the Content. However, we do grant you a licence to access the website and view the Content on the terms and conditions set out in this agreement and, where applicable, as expressly authorised by us and/or our third party licensors. Any reproduction or redistribution of this website or the Content is prohibited and may result in civil and criminal penalties. In addition, you must not copy the Content to any other server or location, and support for publication, reproduction or distribution is expressly prohibited. To the extent permitted by law, including the Australian Consumer Law, we make no warranties or representations about this website or the Content, including but not limited to warranties or representations that they will be complete, accurate or up-to-date, that access will be uninterrupted or error-free or free from viruses, or that this website will be secure, or warranties or representations with respect to any treatment, information, advice or action relied on or followed by any person using our joebloe products. EXCEPT AS EXPRESSLY STATED IN AN AGREEMENT BETWEEN YOU AND JOEBLOE, AND TO THE EXTENT PERMITTED BY LAW, ALL CONTENT, SERVICES, PRODUCTS AND SOFTWARE PROVIDED ON THIS WEBSITE ARE PROVIDED "AS IS" WITHOUT WARRANTY OF ANY KIND, EITHER EXPRESS OR IMPLIED. JOEBLOE AND ITS SUPPLIERS AND LICENSORS DISCLAIM ALL WARRANTIES, EXPRESS OR IMPLIED INCLUDING, WITHOUT LIMITATION, THOSE OF MERCHANTABILITY, FITNESS FOR A PARTICULAR PURPOSE AND NONINFRINGEMENT. YOU ARE SOLELY RESPONSIBLE FOR THE APPROPRIATENESS OF THE SITE, ITS CONTENT, AND THE PRODUCTS AND SERVICES OFFERED BY JOEBLOE ON THE SITE FOR YOUR INTENDED APPLICATION AND USE. HJOEBLOE DOES NOT WARRANT THAT THE SITE, ITS CONTENT, OR THE PRODUCTS AND SERVICES IT OFFERS ON THE SITE MEET YOUR REQUIREMENTS. CERTAIN STATE AND COMMONWEALTH LAWS, INCLUDING THE AUSTRALIAN CONSUMER LAW, DO NOT ALLOW LIMITATIONS ON IMPLIED WARRANTIES OR THE EXCLUSION OR LIMITATION OF CERTAIN DAMAGES. IF THESE LAWS APPLY TO YOU, SOME OR ALL OF THE ABOVE DISCLAIMERS, EXCLUSIONS, OR LIMITATIONS MAY NOT APPLY TO YOU, AND YOU MIGHT HAVE ADDITIONAL RIGHTS. We reserve the right to restrict, suspend or terminate your access to this website, any Content, or any feature of this website at any time without notice and we will not be responsible for any loss, cost, damage or liability that may arise as a result. To the extent permitted by law, including the Australian Consumer Law, in no event shall we be liable for any indirect loss, damage or expense - irrespective of the manner in which it occurs - which may be suffered due to your use of our website and/or the information or materials contained on it, or as a result of the inaccessibility of this website and/or the fact that certain information or materials contained on it are incorrect, incomplete or not up-to-date. To the extent permitted by applicable law, joebloe disclaims any liability resulting from the provision of services by third-party providers, such as our pharmacy partner. Liability shall rest with the appropriate third party provider and shall not under any circumstance be deemed to rest with joebloe. To the extent permitted by applicable law, joebloe disclaims any liability resulting from the provision of services by our joebloe staff. Please don't direct any health-related query to us, discuss it only with your GP. Without limiting the application of the exlusions and limitations set out in this section 14, to the extent permitted by applicable law, under no circumstances will joebloe be liable to you for any of the following losses or damage (whether such losses were foreseen, foreseeable, known or therwise): (a) loss of emotional wellbeing including, but not limited to, any embarrassment caused by your use of the treatments (b) loss of data; (c) loss of revenue or anticipated profits; (d) loss of business; (e) loss of opportunity; (f) loss of goodwill or injury to reputation; (g) losses suffered by third parties; or (h) any indirect, consequential, special or exemplary damages arising from the use of the joebloe products regardless of the form of action. If any of these Terms should be determined to be illegal, invalid or otherwise unenforceable by reasons of the laws of any state or country in which these Terms are intended to be effective, then to the extent and within the jurisdiction which that Term is illegal, invalid or unenforceable, it shall be severed and deleted from the agreement and the remaining Terms shall survive, remain in full force and effect and continue to be binding and enforceable.